Friends, Romans, “Burners”! The Walkabout Woods Needs You! 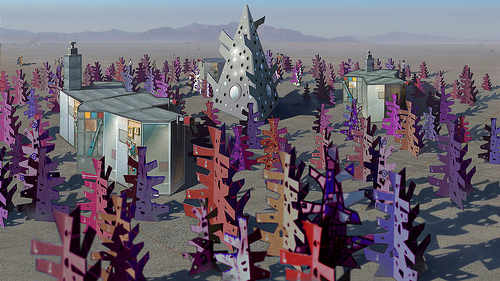 The Walkabout Woods is a large, interactive art installation being built by Fishbon, a non profit arts organization from CA, for the 2011 Burning Man festival. Fishbon, who’s mission is to encourage collaboration between artists, designers and builders, needs some help. First a look at the project. 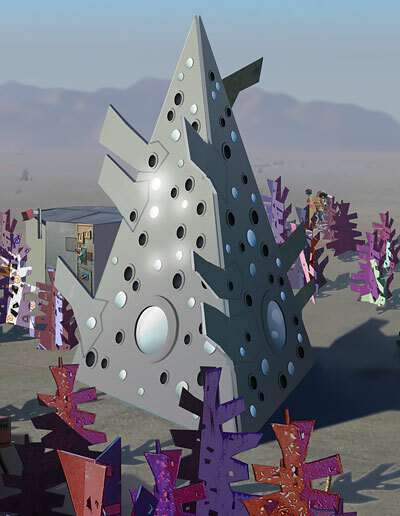 It is a three part art installation: “The Forest, where strange things happen, The Boiler Room, where even stranger things happen and The Pyramid, where you try to make sense of what just happened, or not as the case may be.” The Woods will occupy the Playa, a 160ft x 160ft. area at Burning Man. 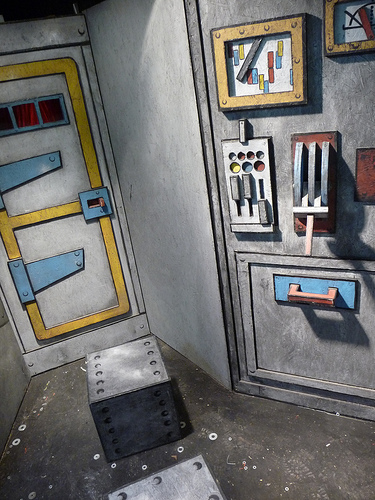 The Boiler Room, a cartoony building, contains a collection of interactive rooms and panels.The largest piece, The Pyramid, will be a 20 foot tall three-sided climbable pyramid. Here is the explanation given on their webpage about the experience the Walkabout Woods should bring to Burning Man. By exploring and engaging in the Walkabout Woods, participants will have the opportunity to connect with their five senses in new and experimental ways, ultimately contributing to a deeper and wider exploration of themselves. Art is always a reflection of our inner worlds. Thus the enchanted forest becomes a metaphor for those structures of perception, mind, and emotion through which we wade to arrive at our deepest truths. Deep in the forest participants will encounter the Boiler Rooms. These self contained creatively engineered sensory interfaces will encourage people to isolate and play with each of their five senses. This interaction may contribute to a greater reflection on how our physical, mental, emotional, and spiritual bodies receive and process information from the world around us. This participatory and contemplative process can be a launch pad for internal transformation. But Fishbon can’t do it alone. The project requires extensive time, supplies and labor. It also requires space, transportation, set up, maintenance, and break down. This is where you can help. The crew at Fishbon started a kickstarter proposal, located here, http://kck.st/g4Q9vo to help make the project a reality. If you’re an Artist, it’s a worthy project to support. If you’re a “Burner”, it’s totally worth supporting! And if you’re the type of person who wants art in your life, it’s worth supporting an organization, like Fishbon, who is trying to make that a reality. 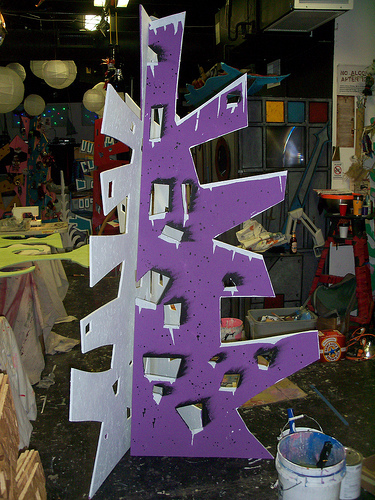 Want more information on the Walkabout Woods project? It’s another great reason to go check out their kickstarter page http://kck.st/g4Q9vo! Go and watch the video, it gives you a much greater view of, and understanding for, the totality of the project. « The Wild World of Kidchuckle! This will be my first burn along with my wife; it’s a time of change & ritual. I’m a musician/teacher and want to explore music and ritual through on the playa. Solo flutes and saxophone with a battery operated amp/effects allows for improvisational composition; sensitive to time, mood, and space. Awesome man! Just because I don’t, or at least haven’t, posted about music doesn’t mean I don’t think it’s art. To me, it may be the single most powerful force in my life. And that’s no joke. Keep writing, keep playing, keep living art!